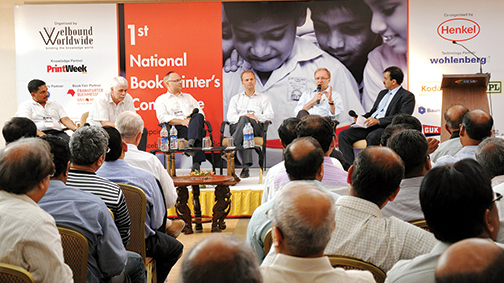 More than 330 delegates from all over India attended the first National Book Printer's Conference (NBPC) in Thiruvananthapuram on 17 and 18 November. The day two of the conference saw the launch of the White Paper (Making India the largest book print exporter of 2017) by India’s biggest book print and publishing CEOs. Khera then announced the concept of a Book City in India. He said: "We've conceptualised a "Content and Book City" plan, which is an eco-system for setting up the content management and print services." Under this concept, the top book print firms (with a partner in the infrastructure space) will build the infrastructure and invite content, print and related media companies / entrepreneurs to offer services and products – being tenants both in a central SEZ and a domestic tariff zone. The core group of top book print firms, through its relationships with global publishers, will bring in business from around the globe and the partner units will be executing the same, in addition to the business that they source on their own. Khera (in the picture above) said: "The endeavour is to transform the printing industry in the country from an unorganised, fragmented "industry" to a well-directed, income and profit generating industry with a well-charted future capable of handling global requirements." A Book City will have publishers, printers, artists' residencies, studio spaces, innovation labs for material experimentation, technologists, publishers, printers, scholars, universities, vocational institutes, apprenticeships, booksellers, wholesalers, logistics - in one zone. Khera’s vision was endorsed by a majority of the delegates who felt the time is apt "to work towards creating a culture for the book industry in India." Besides Khera’s presentation, the panel discussion on both days with the super book printers like Vasant Goel of Gopsons Papers, Gautham Pai of Manipal Technologies, Jayaraman of Multivista Global, Bhuvnesh Seth of Replika Press, Pramod Khera of Repro India and Kapil Raina and Indraneel Mukherjee of Thomson Press looked at their success story; plus the opportunities and challenges in the world book print market. The types of export jobs – what India needs to do to win these contracts. P Sajith of Welbound and a driving force behind the White Paper concept said: "The USP of the conference was; there was healthy cross-section of book publishers (big and independent) who were present at the show." The presentation by Thomas Abraham, managing director of Hachette India set the tone for the panel discussion with Indian book publishers like Cinnamon Teal, Pearsons, Harper Collins, Hatchette India, and others. Besides the panel discussants, there were publishers like MP Printers, Navneet Publications, Orient Blackswan, Oxford, Penguin, Sheth Publishers, Tuilka, etc who contributed to the discussions. In a chat with PrintWeek India, Abraham (in the picture below) pointed out: "The size of domestic book printing is about Rs 7,000 crore according to the survey by Pira International. This is predicted to reach Rs 10,000 crore in 2016. Compare our share in the global book print industry whose size in 2010 is US $ 75 billion (Rs 3.75 lakh crore). India is Rs 1,400 crore, which is less than 0.5%." Besides the two-day book conference, there were technical demonstrations and machine demonstrations by Guk, Henkel, Kodak, Robatech, TechNova, TNPL, Welbound and Wohlenberg at the Welbound factory.